Today marks the switch from black to red as humans have already exhausted the Earth’s resources for 2015. Termed Earth Overshoot day, this early expiration date is becoming an alarming year-on-year trend. The Global Footprint Network records that this day fell on August 19 last year and is symptomatic of the general trend that sees human demand constantly outstripping the available products of our planet. Between now and 2016, we will pillage local resource reserves, and continue to sequester carbon dioxide, adding to the atmospheric overload. Over the past eight months, humans have collectively lived beyond their means, asking the impossible of their biosphere. 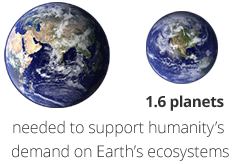 It is sobering to think that, today, we need 1.6 Earths to supply the demands made on nature. The irony that I am writing this in Geneva airport waiting for a delayed EasyJet flight back for a weekend in Blighty is not lost on me. What it alerts one to is the absence of national average measures relating to this environmental budget: my usage is not necessarily the same as that of a 24-year old female living in Pan-America or Sub-Saharan Africa. Notwithstanding the broad spectrum nature of these statistics, the global impact cannot be ignored. Without even considering other species, habits of the minority are damaging the state of the environmental economy for future generations, while indirectly crippling the lives of many currently sharing the same planet. While interning at the WHO sponsored Roll Back Malaria Partnership this summer, my research focused on the commonsensical, but research- poor, association between malaria mortality and varying weather conditions. The exploration poses many questions, all of which will need answers that enact change. The UN General Assembly’s Climate Change Convention, held this June in New York, marks the halfway point in what is a critical year for climate change negotiations, culminating in the United Nation’s Climate Change Conference. This meeting provided impetus and political momentum for an ambitious climate action plan, the framework for which is being drawn from work hubs in Addis Ababa, New York, and Paris. Roll Back Malaria’s Action and Investment to Defeat Malaria, 2016-2030 publication identifies the following climate related goal: ‘given that climate change is predicted to increase the range and intensity of malaria transmission, plans to mitigate the effects of climate change are likely to include an increased commitment to controlling and eliminating malaria, and vice versa’. Weather and climate are major determinants of malaria. The Intergovernmental Panel on Climate Change has concluded that changes in temperature and rainfall will affect the natural habitats of mosquitoes, changing the prevalence of the vector or prolonging transmission seasons (or both) in some areas . Climate change increases the global burden of diseases and reverses developmental gains. Malaria has been identified as one of the most climate sensitive diseases in a review of the Bulletin of the World Health Organization in 2000, with studies suggesting significant associations between temperature and malaria incidence, a connection also made in other vector-borne diseases. Temperature rises (associated with current rates of carbon emission) of just 2-3 degrees Celsius will increase the number of people at risk of malaria by up to 5 per cent, representing several hundred million people . By comparison, a World Bank report indicates that by 2050, climate change might threaten some previously unexposed regions of South America, sub-Saharan Africa and China causing a 50 per cent higher probability of malaria transmission . Such preliminary research invites policy engagement. Findings published in the Open Journal of Ecology call for a better understanding of the relationship between rainfall patterns and malaria cases in order to adopt effective climate change strategies involving planning and implementation of appropriate disease interventions. Their results suggest that maximum temperature is a better predictor of malaria trends than minimum temperature or precipitation, particularly in the transition zone. Climate change effects on malaria caseloads are increasingly seen to be multi-factoral. For effective malaria control, interventions should be coordinated with the most important climatic predictors of the disease for greater impact. This research registers the necessity to implement cross-sectoral change both in tackling neglected tropical diseases, and in diminishing our demands on the planet. Collectively, small changes from unsustainable practices to resource-secure models, education around climate change, and national and third-tier government accountability for such an agenda, will not only hold the promise of a living planet in the future, but one from which people can see malaria eliminated. Appendix B, Action and Investment to defeat Malaria 2016-2030, June 2015. The Postdam Institute for Climate Impact Research and Climate Analytics, ‘Turn-down the Heat – Why a 4 degree Warmer World Must be Avoided,’ International Bank for Reconstruction and Development and World Bank, Washington, DC, 2012.